When the editorial staff of Semana, a feisty Bogotá-based weekly news magazine, was closing out their Feb. 21 edition, they couldn’t help but notice an unmarked car parked for several hours in front of their building. This came as no surprise to editor- in-chief Alfonso Cuéllar, who supervised a six-month long investigation of illegal wiretapping by Colombia’s domestic intelligence agency, the Administrative Department of Security, known in Colombia as the DAS. “We knew that both the good guys and the bad guys were aware that we were working on the story,” said Cuéllar in a recent interview from Bogotá. “That’s partly why the DAS was shredding all of the evidence a month before it broke.” Backed up by numerous sources and documents, Semana exposed how members of the DAS were illegally spying on Supreme Court judges, former Colombian president César Gaviria, opposition politicians, prominent journalists and even high-ranking members of the ruling party. Amongst a roster of Machiavellian allegations — from KGB-like tactics used to create “vice files” on prominent politicians, to the selling of sensitive intelligence to narco traffickers and those with links to illegal paramilitary organizations and the National Liberation Army (ELN) guerillas — is one charge that will be of particular interest to the United States, especially as the country contemplates the fallout from its own domestic surveillance scandal. The U.S. government, according to the Semana report, supplied the sophisticated interception devices used by the spies in Colombia. The Oakley Networks contract came as part of the more than $5 billion the United States has sent to Colombia since 2000 to fund Plan Colombia, ostensibly an effort to eradicate production of the coca leaf. The funding has continued despite the Colombian military’s ties to right-wing paramilitary groups and to the killing of union leaders, human rights activists and indigenous people. In Bogotá, the ramifications of the Semana investigation were immediate. The offices of the DAS were raided by the Colombian prosecutor general’s office, the day following Semana’s original story, and the agency’s director general, Capt. Jorge Alberto Lagos, resigned the following week. The entire high command of the agency submitted letters of resignation and Colombia’s attorney general recently declared that 22 DAS detectives had been fired and would face “judicial and administrative investigations,” while also intimating that more dismissals are coming down the pike. Colombian President Álvaro Uribe, for years the Bush administration’s staunchest ally in Latin America, quickly denied any role in the imbroglio and declared that wiretapping would be immediately reassigned to the National Police. As this was the third such scandal in the DAS under Uribe’s watch, not everybody is taking the denial at face value. The scandal broke just four months after the former head of the DAS resigned after admitting it spied on a prominent leftist politician who had exposed ties between Uribe and rightwing death squads. The spy scandal does not appear to have dampened U.S.-Colombian relations. 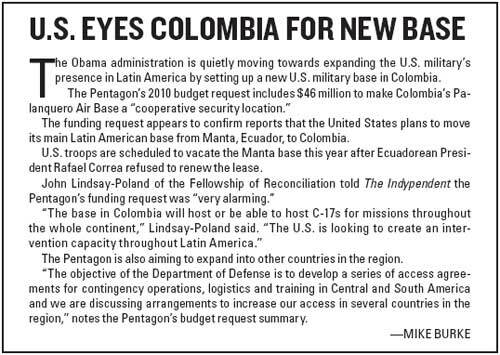 Semana broke the story just before Colombia sent a highlevel delegation to meet with Obama administration officials. On Feb. 25, U.S. Secretary of State Hillary Clinton welcomed Colombian Foreign Minister Jaime Bermúdez Merizalde by saying, “It’s a real pleasure to have the representative of a country that has made so many strides and so much progress, and we have a lot to talk about because there is so much we have in common to work on.” Less than two months later, at the Summit of the Americas, President Barack Obama sat next to Uribe and discussed the possibility of a U.S.-Colombian “free trade” agreement — a deal Obama opposed on the campaign trail. In Bogotá, U.S. embassy officials have not denied playing a role in the Colombian spy operation. 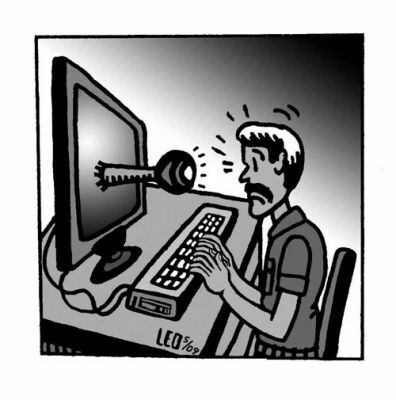 Semana’s Alfonso Cuéllar says he hopes the paper’s report will put an end to illegal spying. Joseph Huff-Hannon is an independent journalist based in Brooklyn who writes on politics and culture. A coalition of U.S. organizations have called on the U.S. embassy in Bogotá to pressure Colombian officials to stop spying on human rights and peace organizations. Between 2006 and 2008, Colombian agencies reportedly intercepted more than 150 email accounts of groups including the Fellowship of Reconciliation, the oldest interfaith peace organization in the United States. “[This] puts at risk our field team and the communities we work with, by suggesting that those working for peace and human rights are subversive, legitimate targets for right-wing violence,” said John Lindsay-Poland, co-director of the Fellowship’s Task Force on Latin America. The spy operation began after the U.S. State Department awarded a $5 million contract to the California-based Oakley Networks to provide “internet surveillance software” to the intelligence unit of the Colombian National Police as part of Plan Colombia. “U.S. taxpayers were apparently paying for Colombian agencies to spy on legitimate U.S. and Colombian humanitarian organizations,” wrote the authors of a December 2008 letter to U.S. Ambassador William Brownfield in Bogotá. In addition, the Fellowship of Reconciliation fears a June 2007 break-in at the organization’s Bogotá office was connected to the surveillance campaign. “We’ve also now learned that the Colombian military paid for computer hard drives of interest to intelligence’ agencies … These stolen laptops contained sensitive files on our work with members of Colombian peace communities,” Lindsay-Poland said.